– Eva, we have just seen a nice video from the simultaneous exhibition you had with local kids. What are your impressions about the venue and your work here in Khanty-Mansiysk? – The Ugra Chess Academy is a unique place for kids to study and to improve in chess. I must say that I immediately fell in love with all the kids, teachers and the place itself. I wish we had something like this in Slovakia. This is a great inspiration for me to build a similar academy in my country. I also would like to thank all the people who give us commentaries on the games because their work is often underestimated but it’s a very hard work to sit and comment for many hours so that we can have a nice and pleasant time. – Speaking about the work of the Appeals Committee, fortunately, there’s not much work for you up to this moment. But what are your impressions about the event and the play of our participants? – Most of the players here are also my friends. This is a great opportunity for me to talk to them about their needs, their professional life. And I also enjoy their fighting in the games and sometimes I feel sorry when some of my friends has to leave and to go home. It’s a tough life here for them. – Which game of the tournament is the most exciting one for you up up this point? – There is no one single game. But I like the young players under 20 here – Gulrukhbegim Tokhirjonova from Uzbekistan and Zhansaya Abdumalik Kazakhstan. They have great fighting spirit and a big will to win. They have advanced to the third round so they are my personal favorites now. – And you have just told that you would like to have a similar academy in Slovakia. What is chess live in your country now? – We have a long way to go. Recently we have started organizing some big international events. My idea is to give something to our society so they can later support us. 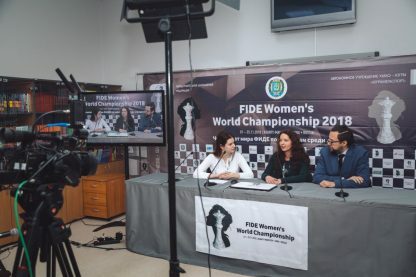 This year we organized the European Women’s Championship and next year we expect almost three thousand people from fifty counties come to the European Youth Championship. We cooperate with our government and we’re getting support for this big event. And every year the situation for the Chess Federation improves. Every year we get a little bit more money so this work pays off so far. 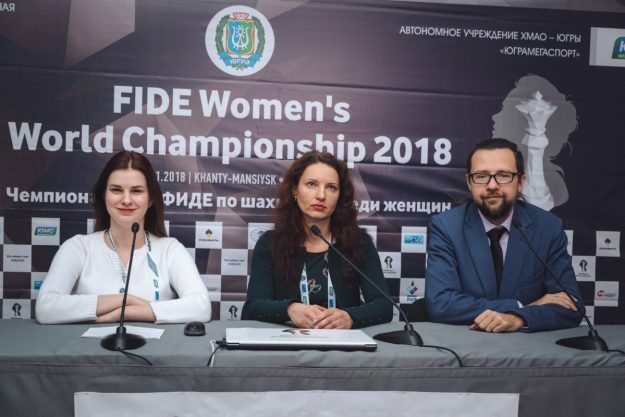 – As a FIDE President Arkady Dvorkovich said the women’s chess would be promoted, the prize founds would be increased and the system of the women’s world championship cycle would be changed. Do you personally have any ideas on how to promote women’s chess? – I talk to many players here and they all are very hopeful about our new President Mr. Arkady Dvorkovich. He promised to improve the situation and the hardest part will be to increase the prize found for women’s events and organize more attractive tournaments for them. And I believe this is the work of FIDE officials to attract more sponsors. I guess it’s not easy but it’s possible with small steps. As I mention we’re all very hopeful about our new president’s activities. I think it’s very important to come by with some experience and new ideas. Actually I like that many grandmasters are involved in FIDE politics now and I am very hopeful that something very good will come out of it. On the other hand, chess players only cannot do all the work because they often lack some skills, but together we can make it, I believe. On the other hand, there are things that we can do as well to promote chess such as follow dress code especially for opening and closing ceremonies and also during the tournaments and to be more open to public although most of us are introverts so it might be hard. But we just should try harder to be open. – Do you think activity in social media like Facebook and Instagram would help to increase interest in women’s chess? – Of course. In today’s world it’s a necessity if you want to make some positive change. Using these tools is for good of chess. – The World Championship match has just opened in London. We asked some of our participants on whom they’re supporting, but what is your choice in this match? – To be honest, I don’t have any favorite but I will follow the match closely and I am looking forward to see very exciting and fighting chess. – Today the first game between Magnus Carlsen and Fabiano Caruana starts in London so the whole chess community will be watching it. What would you say to the fans of chess to make them still keep following this event? – I think it is a little bit boring to watch one game for many hours so I’m sure they will be switching between our games and the World Championship Match. Besides, sometimes when games are played on the highest level there are no mistakes. It’s much more fun to watch games when things change. – And actually we have five hour difference between the games so they have chances to watch all the games. – You said that the most chess players are introverts. Don’t extraverts play chess? – They can do anything including playing chess (laughing). I did not say that all of the chess players were introverts, but it is just my observation and my experience tell me that more of them are introverts. This is just my opinion and what I see during chess tournaments.